Capture 25%-100% more carbon than other planting stock. Clonal forestry has the potential to add significant value to forest plantations and with more than 60 trials established across New Zealand and Australia, to identify and select the best performing clones for production, an increasing volume of clonal planting stock has been successfully deployed to forest plantations. Our Production Varieties represent the very best genetics available in the market today. We can assist in quantifying gain and tailoring our varieties to your specific forest sites and products. 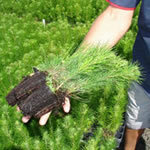 Production Varieties developed for New Zealand and Australia are derived from top crosses of New Zealand Radiata Pine Breeding Company parents, which are themselves genetically superior in quality. The production cycle runs through 7 stages from initial field trials all the way to the final planting of cuttings in nursery beds. With more than 140 field trials underway in Australasia, results have provided the necessary proof that the cloning technologies are working as a very practical tool in creating superior trees. Tree stock sales are limited so contact us for further information.